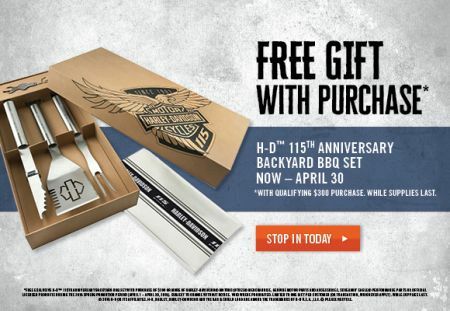 *Free exclusive H-DTM 115th Anniversary Backyard BBQ Set with purchase of $300 or more ofHarley-Davidson® MotorClothes® Merchandise, Genuine Motor Parts and Accessories, Screamin’Eagle® Performance Parts or official licensed products during the 2018 spring promotion period (April 1 – April 30, 2018). Subject to change without notice. Void where prohibited. Limited to one gift per customer (or transaction, whichever apply). While supplies last.